Designed by Stephanie Seabrook Hedgepath Friendship Baptist Church is tucked away from the main road that goes through Hiawassee, GA in the beautiful mountains of north Georgia. Built in 1876, it sits atop a small hill and is constructed of native fieldstone. I saw it in the dead of winter, so added the azaleas in bloom and the yellow Jessamine over the door. Ask for this new cross stitch design in your local needlework shop or online store. 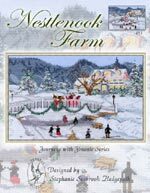 Remember our new design of Nestlenook farm if you looking for something beautiful to stitch for Christmas. Also our Chicken Scratch books are still in our top 10 best sellers every month so if you are looking for something really different and lacy looking, try our free pattern from our downloads area. We have four books of those designs. Stitch Count 150W X 117H - Glenariff Cottage was found on a trip to Ireland, where I was invited to judge dogs at the Belfast Dog Show Society show. Many thanks to Caroline Reynolds for suggesting that my husband, Jim take a day to hike in Glenariff Forest, just north of Belfast in Northern Ireland. As Jim made his way from Belfast to the park in County Antrim, he discovered this sweet cottage right on Glenariff Road. Glenariff Forest is one of the world famous Glens of Antrim, an area to which tourists have been coming for over a century. Glenariff, called the Queen of the Glens, is considered by many people to be the most beautiful of the nine Antrim Glens. If you ever get a chance to go to Ireland, GO! It is the friendliest place on earth and beautiful beyond words. Announcing Hunter House- #486 Designed by Stephanie Seabrook Hedgepath This is the third in the Journeys with Jimanie series. Located just 1 hour east of Atlanta on I-20, Madison, GA has long been a favorite stop for Jim and I when traveling to or fro on the interstate. It is known as the town Sherman refused to burn. Of the many Victorian houses that have been preserved, the most celebrated of them is the Hunter House. An 1883 Queen Anne-style home with a hipped roof with cross gables and a square tower, Hunter House is the most photographed house in Madison. Both the first and second story porches have beaded and shaped spindlework. As might be expected, Madisons cache of period homes has made it an important stop on Georgias Antebellum Trail, a 100-mile tour that covers seven towns in the heart of the state from Athens to Macon. As you bring Hunter House to life with your stitching, I hope you dream of Southern belles and moss-draped trees! 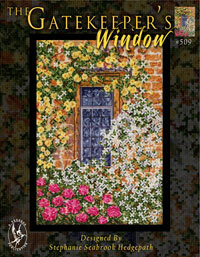 Stitch Count 170W X 100H - 59 colors Our Model on the cover was stitched on 28ct Lugana on Wedgewood fabric from Zweigart with DMC floss. One of the delightful cottages we photographed in Adare, Ireland in 2009. It was late September and the Hydrangeas were in full bloom. With the beautiful Irish lace curtains, the Virginia Creeper above the window and door and the beautiful hydrangeas, I felt drawn to this cozy entrance. One of the delightful cottages we photographed in Adare, Ireland in 2009. It was late September and the Hydrangeas were in full bloom. With the beautiful Irish lace curtains, the Virginia Creeper above the window and door and the beautiful hydrangeas, I felt drawn to this cozy entrance. Kit includes: charted design,instructions, picture,seperated and carded DMC floss, 14 count fabric and needle. 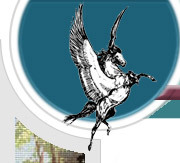 Announcing Navarre Cottage - #485 Designed by Stephanie Seabrook Hedgepath Second in the Journeys with Jimanie series, Navarre Cottage was discovered on a side trip after a dog judging assignment in Ohio. This time I was accompanied by my dear friend, Audrey Hiers, and we were heading for prime antiquing country when we were enticed to stop and photograph this lovely cottage on the outskirts of Navarre, Ohio. While I was taking photos of it, the front door opened, and out came the owner. She explained that the daughter of the man who had built the cottage had called as she wanted to come by and see the place. She thought perhaps I was that daughter when she saw me taking photos of it. We had a pleasant chat and I discovered that they had just returned from a vacation, of all places, on Seabrook Island (outside of Charleston, SC) an island named after my family and on whose beaches I had spent many a day in my childhood. 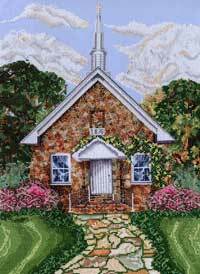 I hope you enjoy stitching this sweet cottage as much as I enjoyed designing it for you. 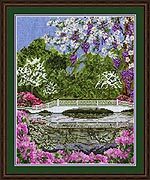 Stitch Count 146W X 102H - 81 colors Our Model was stitched on 28ct Lugana on Wedgewood fabric from Zweigart with DMC floss. Jimanie is the kennel name Stephanie uses for her show kennel of Pembroke Welsh Corgis. It is a combination of her name and the name of her husband, Jim. Since this series is going to include many places photographed on trips they have made together or on trips Stephanie has made for dog judging assignments, it seemed natural to name it Journeys with Jimanie. Stitch Count 190W X 121H Found in Jackson, NH, Nestlenook Farm is a popular country inn and resort near Mount Washington. While we photographed the area in the fall, I was so intrigued by the Inn's yearly hosting of a "Victorian Afternoon", when they celebrate the days when sleighs and ice skating were a common mode of travel, that I chose to depict the area in the snow with skaters on the Ellis River and a horse drawn sleigh on the bridge. 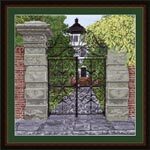 Journey with Jim and Stephanie to 32 Legare Street, Sword Gate, Charleston, SC where Stephanie photographed this beautiful setting and converted it into counted cross stitch. The wrought-iron gates leading to this property from Legare (pronounced le  GREE) Street bear an elaborate sword and spear design. Considered one of the finest gates in Charleston, they were made by the ironworker Christopher Werner by mistake when he was completing a similar pair for the Charleston Guardhouse in 1830. The gates were added to the house at number 32 in 1838. The three-story wooden house with fanlighted piazzas had been completed before 1810 by Solomon Legare and sold nearly a decade later to the Talvande family, refugees from Santo Domingo. Madame Talvandes girls school was considered the best by Charlestons elite in the 1820s and 1830s. By tradition, the high brick walls were added to enclose the property during this period. This has always been one of my favorite scenes in Charleston!